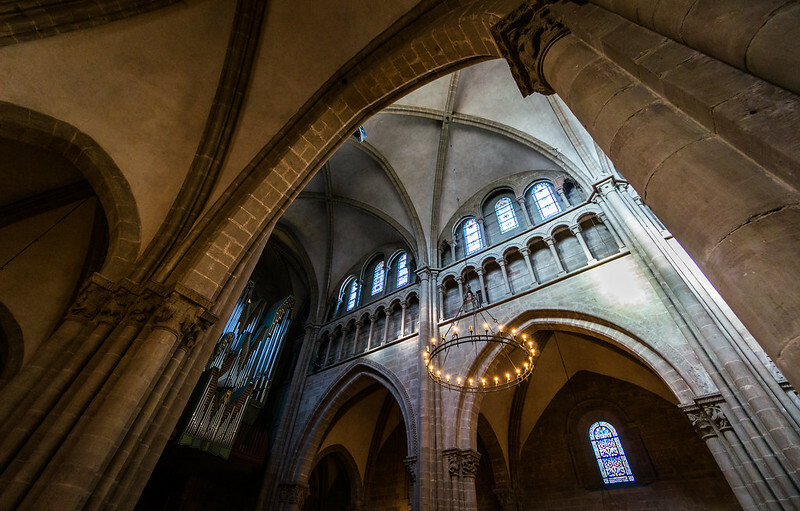 Inside Geneva’s St. Pierre Cathedral | Flights. Camera. Satisfaction. In modern times Geneva is probably best known for its association with the United Nations and the Swiss banking industry. But back in the 1500’s it was considered the “Protestant Rome”, the unofficial capital of the Reformation. St. Pierre’s Cathedral was the adopted church of John Calvin, a leader of the movement away from the Catholic church. Protestant exiles from all over Europe came to Geneva to take refuge, so while it’s not the most interesting church to look at it’s certainly historically significant. I always enjoy exploring the geometry inside cathedrals like this. There are so many different ways to frame a shot, with crazy lines all over the place. I’ve found one of the most effective techniques is to try and use features of the interior to frame other elements in the shot. This normally provides some nice depth to the image from front to back. This entry was posted in Switzerland and tagged architecture, Architecture Photography, Cathedral, Church, Geneva, interior, Photography, Reformation, St. Pierre Cathedral, Switzerland, travel photography on September 16, 2014 by Ben. Ben, in your chosen angle, you have managed to capture the essence of everything I think about when I think of a cathedral – soaring arches, stained glass windows, a massive pipe organ, candles, and chandeliers. You’ve given us a wonderful view of the beauty of St. Pierre’s. I just love your photo! Beautiful photo ~ love the angle. I love the angle you took the shot. The lighting is great!